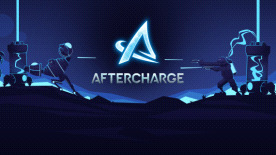 An invisible team fighting an invincible team, reviving allies instantly with no limit and zero cooldown on abilities are only a few mechanics that make Aftercharge a shooter you've never played before. Choose from a different character pool on each side with widely different abilities and roles to vary your team's strategy. Copyright © 2018 Chainsawesome Games. All rights reserved.